Delegations from GYB and the Payerne airbase training center; teachers, and students of our activities "Payerne Space Days" and "Op ARISS"
At 4 pm, Christophe Keckeis, former "Chief of the Armed Forces" and former president of Espace Passion Clin d'Ailes, took the VIP guests on a guided tour through the museum. At 5 pm, the museum was open for individual visits to all guests. 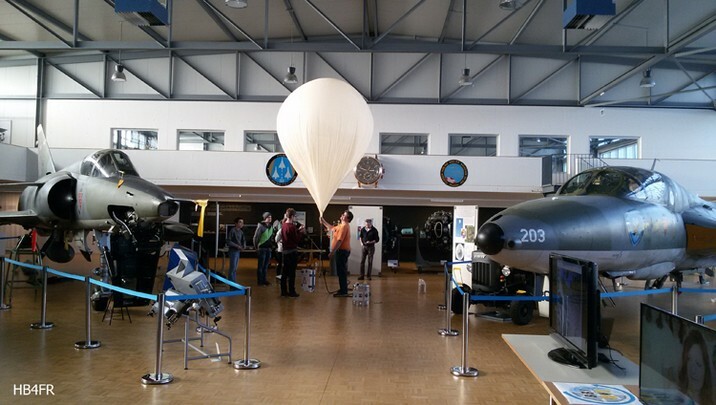 On this occasion Jean-Yves, HB9FOU, with former electronics students of the Air Base the showed the stratospheric weather balloon "HEIDI". This balloon with its payload, has been developed and built by these young people as part of our ARISS- 2012 Operation. 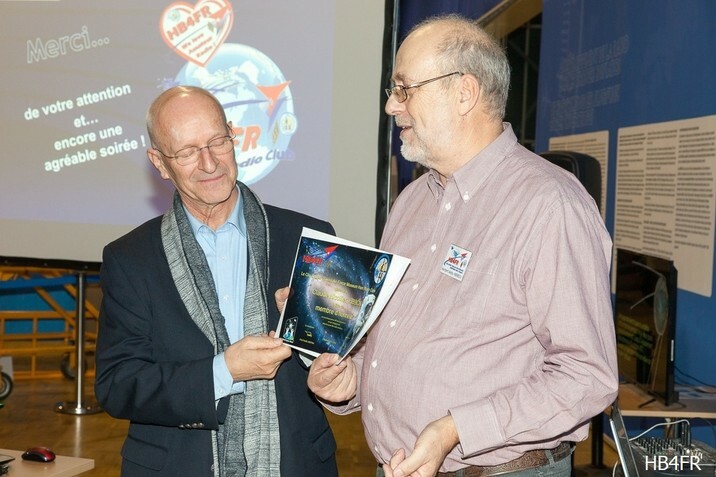 Visitors could also follow presentations of our activities in the museum, such as the "Payerne Space Day", ARISS and others. Coming? Or not coming? After a few minutes of extreme tension and some manipulations on the PCs on both sides, suddenly, that's it, here he is: Thomas, DF4TR (DPØISS in 2006) smiling on the big screen, happy having mastered the technical traps and being with us. Exactly as in 2006: everything is good that ends well! President Herbert, HB9BOU welcomes and thanks Thomas for his presence which we highly appreciate. He also reminds him that he is, within the framework of "Operation ARISS-GYB 2006", at the origin of our club and that he is crowning our 10 years of existence with his presence among us, even only on a big screen. The conversation between Claude, HB9CN, and Thomas, DF4TR which follows is very interesting and embellished with points of humor. As the picture above shows, Claude Nicollier, HB9CN, and Herbert, HB9BOU, were accompanied by Nathalie Lamon, the daughter of our friend Daniel, HB9DLZ (Silent Key & dagger;). 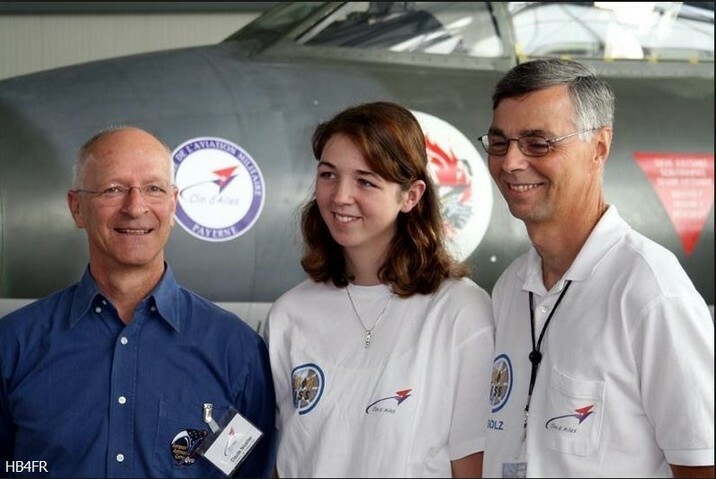 She was one of the GYB students who spoke with Thomas Reiter (DPØISS) aboard the ISS in 2006. 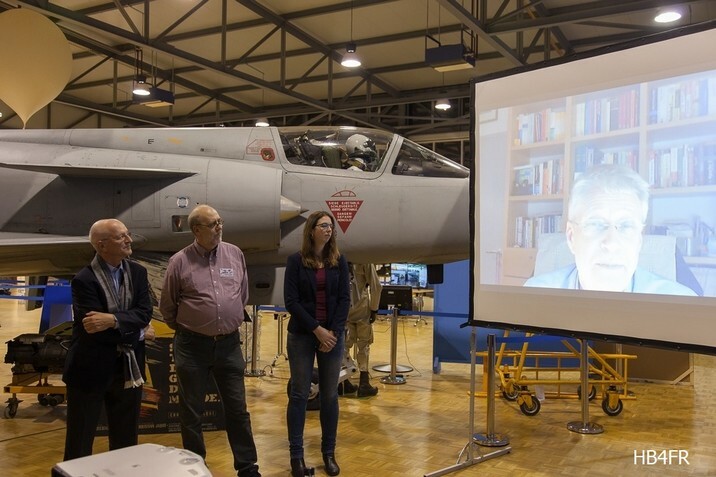 And now she's talking to the astronaut again, telling him about her emotions and feelings at the time, and what consequences this ARISS contact brought: Nathalie will soon follow in the footsteps of her father as a radio amateur! A good quarter of an hour has passed and Thomas, DF4TR congratulates us on the achievements and leaves us. The President is now taking over, tracing the major milestones of space travel and navigation to the era of Claude Nicollier. Fritz, HB9TNA, presents a retrospective, from the beginning of the association to today, which is much appreciated. This review showed very well the importance of the collaboration of Claude Nicollier and our club in the work for, and with, the youth. It is time to appoint our friend HB9CN as an honorary member. President Herbert honors Claude with a laudatory speech and with great applause he becomes our fifth honorary member. As a thank you for all services to HB4FR he receives a "pantograph". A unique collector's item and historical device, Austrian construction, which in reality is a theodolite. 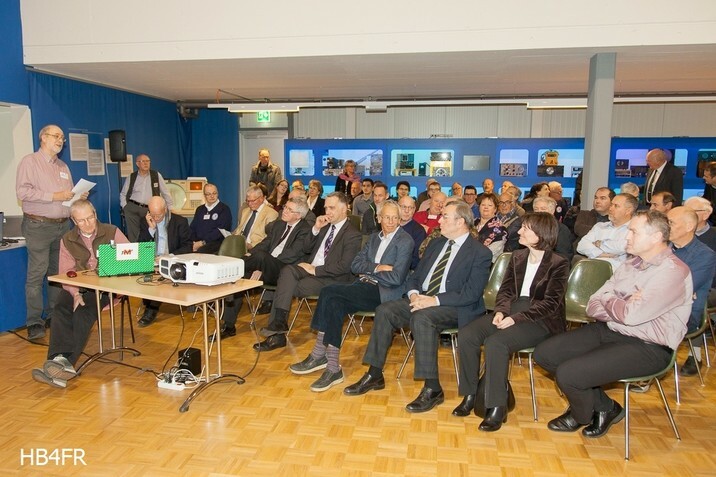 After the congratulations and the thanks of the museum director Jürg Studer and the words of thanks of the president to all members and all those who have supported us in the last ten years, the official part ends with the applause of the audience. After all these impressions and sometimes even emotive moments, the empty stomach and the dry mouth spoke up. It's snack-time now, prepared by Patricia, manager of the cafeteria and good fay of the museum. The variety of canapés and petit fours is excellent. The wine can not speak, but triggers many stories and memories. On behalf of well-known guests, we receive a lot of good words that encourages us to tackle the next decade of our club. It is already late when the last ones leave the museum. SUCCESS IS TO REACH WHAT WE WANT, LUCK IS TO ENJOY WHAT WE REACHED. 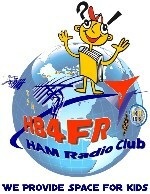 For the past 10 years, HB4FR has got what it wanted and we have achieved our goals. We appreciate what we have achieved so far, and we can be proud of it, dear members! We were delighted to share HB4FR's birthday on 2 December 2016 with everyone who accepted our invitation. IT WAS A NICE CELEBRATION – LONG LIFE HB4FR ! 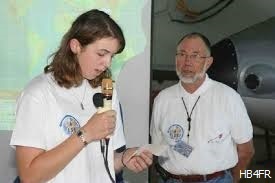 In the meantime, Nathalie followed in her father's footsteps and passed her amateur radio exam. She is now reviving the call of her dad, HB9DLZ, on radio waves, congratulations. 22 September 2006 - Nathalie, today HB9DLZ, asks her question toThomas Reiter aboard the ISS.